We’d love your help. Let us know what’s wrong with this preview of The War that Saved My Life by Kimberly Brubaker Bradley. Nine-year-old Ada has never left her one-room apartment. Her mother is too humiliated by Ada’s twisted foot to let her outside. So when her little brother Jamie is shipped out of London to escape the war, Ada does An exceptionally moving story of triumph against all odds set during World War 2, from the acclaimed author of Jefferson’s Sons and for fans of Number the Stars. To ask other readers questions about The War that Saved My Life, please sign up. Amy There is nothing juvenile about the writing or the emotions in this book! I would love to read it for a book club. It has tremendous depth and…moreThere is nothing juvenile about the writing or the emotions in this book! I would love to read it for a book club. It has tremendous depth and resonance. I was blown away by the depth of emotions (both love and hate) for the various characters in this book! Wonderful growth of MC, Ada, from beginning to end. It was fun to watch her gain internal and external strength. Now THIS is a "good read", don't you think? Amy I wish I could give it 6 stars. I loved everything about it. As a child I was what one might call a selective reader. Selective in that I studiously avoided any and all works of fiction that might conceivably be considered “depressing”. Bridge to Terabithia? I’ll have none please. Island of the Blue Dolphins? Pass. Jacob Have I Loved? Not in this lifetime. Lord only knows what caused a book to be labeled “depressing” in my eyes before I’d even read it. I think I went by covers alone. Books picturing kids staring out into the vast nothingness of the univer As a child I was what one might call a selective reader. Selective in that I studiously avoided any and all works of fiction that might conceivably be considered “depressing”. Bridge to Terabithia? I’ll have none please. Island of the Blue Dolphins? Pass. Jacob Have I Loved? Not in this lifetime. Lord only knows what caused a book to be labeled “depressing” in my eyes before I’d even read it. I think I went by covers alone. Books picturing kids staring out into the vast nothingness of the universe were of little use to me. Happily I got over this phase and eventually was able to go back to those books I had avoided to better see what I had missed. Still, that 10-year-old self is always with me and I confer with her when I’m reading new releases. So when I read The War That Saved My Life I had to explain to her, at length, that in spite of the premise, cover (again with the kids staring out into nothingness), and time period this isn’t the bleak stretch of depressingness it might appear to be. Enormously satisfying and fun to read, Bradley takes a work of historical fiction and gives the whole premise of WWII evacuees a kick in the pants. Ada is ten and as far as she can tell she’s never been outdoors. Never felt the sun on her face. Never seen grass. Born with a twisted foot her mother considers her an abomination and her own personal shame. So when the chance comes for Ada to join her fellow child evacuees, including her little brother Jamie, out of the city during WWII she leaps at the chance. Escaping to the English countryside, the two are foisted upon a woman named Susan who declares herself to be “not nice” from the start. Under her care the siblings grow and change. Ada discovers Susan’s pony and is determined from the get-go to ride it. And as the war progresses and things grow dire, she finds that the most dangerous thing isn’t the bombs or the war itself. It’s hope. And it’s got her number. I may have mentioned it before, but the word that kept coming to mind as I read this book was “satisfying”. There’s something enormously rewarding about this title. I think a lot of the credit rests on the very premise. When a deserving kid receives deserving gifts, it releases all kinds of pleasant endorphins in the brain of he reader. It feels like justice, multiple times over. We’re sympathetic to Ava from the start, but I don’t know that I started to really like her until she had to grapple with the enormity of Susan’s sharp-edged kindness. As an author, Bradley has the unenviable job of making a character like Ada realistic, suffering real post-traumatic stress in the midst of a war, and then in time realistically stronger. This isn’t merely a story where the main character has to learn and grow and change. She has this enormous task of making Ava strong in every possible way after a lifetime of systematic, often horrific, abuse. And she has to do so realistically. No deus ex machina. No sudden conversion out of the blue. That she pulls it off is astounding. Honestly it made me want to reread the book several times over, if only to figure out how she managed to display Ada’s anger and shock in the face of kindness with such aplomb. For me, it was the little lines that conveyed it best. Sentences like the one Ada says after the first birthday she has ever celebrated: “I had so much. I felt so sad.” It’s not a flashy thing to say. Just true. You can see the appeal of writing characters like Ada and Jamie. Kids who have so little experience with the wider world that they don’t know a church from a bank or vice versa. The danger with having a character ignorant in this way is that they’ll only serve to annoy the reader. Or, perhaps worse, their inability to comprehend simple everyday objects and ideas will strike readers as funny or something to be mocked. Here, Bradley has some advantages over other books that might utilize this technique. For one thing, by placing this book in the past Ada is able to explain to child readers historical facts without stating facts that would be obvious to her or resorting to long bouts of exposition. By the same token, child readers can also pity Ada for not understanding stuff that they already do (banks, church, etc.). Ms. Bradley has written on her blog that, “I don't write in dialect, for several reasons, but I try to write dialogue in a way that suggests dialect.” American born (Indiana, to be specific) she has set her novel in historical England (Kent) where any number of accents might be on display. She could have peppered the book with words that tried to replicate the sounds of Ada’s London accent or Susan’s Oxford educated one. Instead, Ms. Bradley is cleverer than that. As she says, she merely suggests dialect. One of the characters, a Mr. Grimes, says things like “Aye” and ends his sentences with words like “like”. But it doesn’t feel forced or fake. Just mere hints of an accent that would allow a reader to pick it up or ignore it, however they preferred. Basically what we have here is Anne of Green Gables without quite so much whimsy. And in spite of the presence of a pony, this is not a cutesy pie book. Instead, it’s a story about a girl who fights like a demon against hope. She fights it with tooth and claw and nail and just about any weapon she can find. If her life has taught her anything it’s that hope can destroy you faster than abuse. In this light Susan’s kindness is a danger unlike anything she’s ever encountered before. Ms. Bradley does a stellar job of bringing to life this struggle in Ada and in inflaming a similar struggle in the hearts of her young readers. You root for Ada. You want her to be happy. Yet, at the same time, you don’t want your heart to be broken any more than Ada does. Do you hope for her future then? You do. Because this is a children’s book and hope, in whatever form it ultimately takes, is the name of the game. Ms. Bradley understands that and in The War That Saved My Life she manages to concoct a real delight out of a story that in less capable hands would have been a painful read. This book I would hand to my depression-averse younger self. It’s fun. It’s exciting. It’s one-of-a-kind. I know it seems like I’ve been tremendously lucky lately, what with all the four-star-ratings I’ve been giving, but it’s only because—and I’ve done this for the whole month of March—anytime a book bores me, I put it aside and never get back to it. Good, bad? Remains to be seen. That being said, THE WAR THAT SAVED MY LIFE was extraordinary and didn’t bore me one bit. No wonder it won so many awards. It’s a refreshing middle grade historical fiction book that deserves to be read by adults as well. I know it seems like I’ve been tremendously lucky lately, what with all the four-star-ratings I’ve been giving, but it’s only because—and I’ve done this for the whole month of March—anytime a book bores me, I put it aside and never get back to it. Good, bad? Remains to be seen. That being said, THE WAR THAT SAVED MY LIFE was extraordinary and didn’t bore me one bit. No wonder it won so many awards. It’s a refreshing middle grade historical fiction book that deserves to be read by adults as well. It’s such a wonderful book that calls to your emotional side. I used the word ‘‘refreshing’’ to describe it above because, although many historical books describe the events of World War II, not many look at children evacuees. Indeed, Ada and Jamie flee from London to escape from the predicted German attacks. They have to leave their abusive mother to do so, but for Ada that isn’t going to be an action she will ever regret. The woman who welcomes them—quite begrudgingly—into their house will make them understand what being cared for truly means. Although the backdrop is a terrified England, the war is never the main point of the story, even if the title says otherwise. It’s true that the war saves Ada’s life, in a way, but the main focus of this story is the interactions between Ada, Jamie and their new guardian as well as Ada’s confidence and freedom growth. Once afraid of her monstrous mother, Ada will learn to calm the fear that has grown inside her for so many years. Call me dumpling, if this isn't a Newbery contender for 2016. The historical details, character development, tight plot, and rich layered themes make this firecracker sizzle. Ten-year-old Ada has a clubfoot and is kept locked in her family's one bedroom apartment while her six-year-old brother, Jaimie, roams free in London, England. Mam hits her two children and punishes Ada by locking her in the cabinet under the sink. World War II is about to happen, and parents are sending children to the cou Call me dumpling, if this isn't a Newbery contender for 2016. The historical details, character development, tight plot, and rich layered themes make this firecracker sizzle. Ten-year-old Ada has a clubfoot and is kept locked in her family's one bedroom apartment while her six-year-old brother, Jaimie, roams free in London, England. Mam hits her two children and punishes Ada by locking her in the cabinet under the sink. World War II is about to happen, and parents are sending children to the countryside for safety. Mam plans to send Jaimie, but not Ada, "Nice people don't want to look at that foot." Ada sneaks off with Jaimie to join other evacuees on a train to Kent. Expecting 70 children but receiving 200, the children line up in a building near the station and are chosen by families, but no one picks Ada and Jaimie. The "iron-faced" woman organizing the placement takes the two to a house where the owner, Susan Smith, says she doesn't want any children to care for. The reason for Susan's reluctance is slowly revealed and though she claims she is not nice, her actions show the opposite. She suffers with bouts of depression and the three form a family bond that helps them all move forward in life and deal with suffering. The ironic title of this book refers not only to the physical war, but the internal and daily battles faced by the characters. War is about death and destruction, not saving; however, there are times when "some things are worth fighting for." WWII meant fighting against loss of freedoms, lands, and extreme prejudices. Most people didn't want to go to war and avoided it until it became necessary. For Ada, "There are all kinds of wars." She talks about her war with Jaimie whom she has raised instead of their negligent mother. She talks about her war with her mother who hits her in order to shame and control her. She sees Susan war with people who act prejudiced toward her disability. She sees Jamie war with his fears. She sees Susan war with her grief. The war theme builds like a wet snowball rolling down a snowy hill getting bigger and bigger until it rests at the bottom doubled in size. The author keeps building on various themes and advances the plot pointing to those themes. This is just one element in Kimberly Brubaker Bradley's impressive writing that makes this book unforgettable. *spoiler* I want to use this book for book club next fall so the following is more detailed than usual so I'll remember my first impressions. Daily life is filled with peace and joy and battles and wars. Ada's life is no different except her conditions are more extreme. She battles the prejudice of her mother and others over her clubfoot. She battles hunger on a daily basis. She battles her feelings. She battles being touched by another human. She battles looking forward to the future with hope. She battles being illiterate. Ada is tired of being ignorant of the world and the words in it. She's been locked up in a room and never let outside. On the train, she asks Jaimie what the green stuff is out the window. Even the word, "grass," is not in her vocabulary. Like someone trying to learn a foreign language, words exhaust her and it is no surprise that she resists Susan's efforts to educate her. It is not until she makes friends with Maggie that she is motivated to read and write. Ada is a survivor, courageous, and persistent. Horses respond to her and when she decides to make her pony jump a wall, she just about kills herself in the effort. She battles back no matter how many times life throws her off a horse. Her physical hunger is nothing compared to her emotional hunger for love, hope, and freedom. When she finds it with Susan, it scares her to heck because she knows their set-up is temporary until the war is over. Ada shuts Susan out to protect herself, but Susan is just as strong-willed as her and she jumps her walls. Jaimie is left-handed and being abused by the teacher. Susan figures it out and rescues him showing she is willing to fight for the two children. The relationship changes from caring to loving - the three are evolving into a family with all its ups and downs. At the end, when Susan doesn't battle for them, it is no surprise that she changes her mind and tracks down Mam and the kids. At the end when Susan tells Ada and Jaimie that they saved her life, the story has come full circle. Both children have fears. Jaimie has tantrums and wets the bed while Ada is afraid of being hit and sent away. When Jaimie finds a mean cat that is full of fleas and matted hair, he names it Bovril after a nasty drink that Susan makes the children take each night for their health. The cat, Bovril, is loved and cared for by Jaimie. He stops wetting the bed as soon as they keep the cat and after he washes the mangy creature he brings it down wrapped in Susan's "best towel." The parallel with the children is striking for Susan took in two bedraggled children that no one else wanted and gave them the best of herself and home. When Jaimie tells Susan that "nice people" hate Ada's clubfoot, she says they are in luck because she is not a nice person. Ada tries to convince herself of this, but knows it isn't true. "She was not a nice person, but she cleaned up the floor. She was not a nice person, but she bandaged my foot in a white piece of cloth, and gave us two of her own clean shirts to wear." Ada reminds herself all the time that Susan is not a nice person so that she won't become attached to her. She knows that the situation is temporary and she copes by detaching herself. Another overarching theme besides battles and wars, is the difference between lying and liars. Susan distinguishes "lying" as a way of self-preservation or protecting oneself while "liars" do it to make themselves important. Ada lies about her last name when she meets Susan. Later, when Ada tells the truth, it is easy to see why Susan doesn't believe her about riding Maggie's horse. The two learn to be honest and trust each other as they learn to understand each other. The author shows but does not tell these differences and much of it must be inferred by the reader. As the story progresses, Ada chooses to not lie about the spy, nor does she lie with her mother. She slowly turns from lies to the truth and it allows her to move forward emotionally and become a stronger person. Mam is a liar that bullies Ada to make herself feel important. Mam says that fixing Ada's foot is a lie, even though Ada knows it is possible. By not fixing Ada's foot, Mam feels superior. Susan lies about Divinity school to attack the school teacher's prejudice and abuse of Jaimie. Her lie was protective. Stephen lies to the Colonel because he knows that the Colonel needs full-time care. His lie was to help the Colonel not feel useless in the war. Lies are a big part of the author's character development and Ada learns through lies how she can change her life into one of truth and hope for a better life. Ada breaks Susan's sewing machine and is terrified she'll be sent back to London. Ada's terror is not normal and shows how traumatized she has been by her mother's abuse. She also pushes aside her emotions and doesn't address them. She calls it going inside her head. Her psychological and physical abuse make her difficult to handle and Susan doesn't always get it right. Both Ada and Susan are persistent, strong-willed, and stubborn. Susan can't tell Ada to read and write but tricks her into it. Later when Ada realizes that Maggie was mad at her for not writing, she is motivated to learn. Susan tricks Ada into doing other things she refuses to do making for some funny moments. Susan's dry humor helps balance the characters heavy issues. The two females learn from each other. When Ada decides to make a present in her room, Susan says she has to spend equal the time with her that she spends alone. She's grown to like her company and Ada unknowingly is helping Susan deal with her grief. Ada goads Susan into volunteering for the war. Susan tries to get Ada to accept herself and not be ashamed of her foot, "your foot's a long way from your brain." When Ada later uses it against the prejudiced officer, Susan's influence is apparent as Ada finds the courage to stand-up for herself and see her self-worth. Susan's read alouds show how the kids are relating the characters in the stories to their lives. Ada feels that she is like "Alice in Wonderland" who has fallen down the rabbit hole into a strange new world. Jaimie feels like he is on an adventure like the "Swiss Family Robinson." Literature engages and empowers young readers into understanding themselves and the world around them. Ada is learning empathy and through narrative fiction she can get inside a fictional character's mind to understand his or her feelings, motivations, and emotions. This safe place in the fictional world lets her take risks and learn through characters triumphs and mistakes, then relate it to herself with empathy, and not have any real-world consequences. This is the power of reading. I do so like books that answer questions right away and then take it one step further in an unexpected way. Brandon Sanderson does this and so does Bradley. For instance, when Ada keeps refusing to go to tea with the Colonel, I thought she was embarrassed by her clubfoot and I know that she feels awkward socially. Later she confesses to Stephen that she is afraid of not doing the right thing. Perhaps a better example is when Susan debates the teacher on her superstition of left-handedness. It could have been left with just the dialogue, but she explains the root of the superstition in the Bible. The author digs deeper into the psyche of characters bringing out their complexities that engages me more as a reader. Bradley has already established herself as an author that pays attention to historical details. Read "Jefferson's Sons" and you will see what I mean. Here, she goes into details regarding the war and maintaining stables and horses. The women sewing blackout curtains and building a rickety, smelly bomb shelter are just two of many examples. Others include the newsreels, that disseminated information to the public before the movies, to the propaganda posters littering the city. The Germans circled the island and sunk ships trying to import or export goods laying siege to England and affecting the food supply. Another fact that parents evacuated their children from London and then took them back endangering their lives when the London Blitz occurred was one I didn't know about. The historical details oftentimes tie in with larger themes, especially the posters such as "Freedom is in peril. Defend it with all your might." Not only is England's freedom in peril, but Ada and Jaimie's freedom living with Susan is in peril when their Mam takes them back. The psychological progression of Ada wanting Susan to not give her things shows Ada clinging to the emotional detachment as a coping mechanism from being abused. Ada rejects Susan's help over and over. Later while reading "Swiss Family Robinson" she thinks "I was tired of those idiots living on an island with everything they wanted." She doesn't want to be given things. Again, her attitude is about self-preservation. Ada has a meltdown when Susan makes her a velvet dress and calls her beautiful. She reveals "It was too much, all this emotion. "She can't see herself as anything but ugly. She doesn't want to love Susan and hope for a better life. Worse, she doesn't want to love herself. When the war comes to their town and Susan and Ada help the Dunkirk soldiers, Ada learns that she is useful. She also recognizes that she is winning battles against her fears and becoming stronger. "There was a Before Dunkirk version of me and an After Dunkirk version. The After Dunkirk version was stronger, less afraid." Later, when she sees a spy and reports it, she is strong enough to overcome the prejudiced officer that tries to dismiss her. When she stands up to her mother and admits the horrible truth about how she does not care about her or Jaimie, she shows her self-acceptance not only of herself but her mother. When she is lauded a hero for capturing a spy, she sees herself, "As if I'd been born with two strong feet." This is a long way from the ashamed girl that first showed up on Susan's doorstep. What a wonderful book. I rarely enjoy recently written books, and the two recently written books I have given 4 stars too become 3 stars in comparison. We read this as a read aloud and from page 1 we were hooked. In fact getting home from the library standing inside the front door I flicked to the first page and read the first couple of pages without realising, totally absorbed. The story begins with Ada and Jamie, they are very poor and live with their single mum. Even though she has so little y What a wonderful book. I rarely enjoy recently written books, and the two recently written books I have given 4 stars too become 3 stars in comparison. We read this as a read aloud and from page 1 we were hooked. In fact getting home from the library standing inside the front door I flicked to the first page and read the first couple of pages without realising, totally absorbed. The story begins with Ada and Jamie, they are very poor and live with their single mum. Even though she has so little you suspect their mother would be awful even if she were well off. Ada and Jamie's lives are bad and then war comes. Without giving away too much of the plot this book follows the siblings lives and gives a good look into World War II and lives of evacuees. We loved the characters in this book, Ada was wonderful, so brave, tenacious and funny. The relationship between Ada and her brother was wonderful, we even loved their squabbles, there were some really humorous descriptions of these. Those who love horses will enjoy the descriptions of Ada's first experiences with a pony called Butter. We loved the way that in the time the book was set you could just have a go or help out at stables in return for riding which is what was possible when I was young but sadly not today. There are some wonderful animal characters and we loved the unusual friendships and the way that the hardships of the war brought people who previously wouldn't have mixed together. Susan was a wonderful character and a natural mother to the motherless. A goodreads friend asked if this was too dark or depressing, it's hard to tell how someone will feel about a book but despite the storyline having sad elements I found this a really positive read and very uplifting, you can tell things are getting better and people are getting stronger in this book. I don't think it's a spoiler to say Ada and Jamie's mother is awful and although their treatment is upsetting you could tell the book is going go be about their escape so this was bearable. I speak from the position of someone whose mother was similar to the mother in the story and I didn't find this part too much, if anything I found this cathartic as I was rooting for them to do something about their situation. Every one of my friends who has just come out of the woodwork to say how much they love this book is DEAD TO ME. Because I literally do not remember one of them telling me that I MUST READ THIS IMMEDIATELY, and they should have. I remember a bit of buzz around it as Newbery season rolled around. I remember there being "no surprise" when it was named as an honor book. So I dutifully bought it, read the first page, thought, UGH, HOW HORRIBLE! and put it aside. The sequel just came out and every Every one of my friends who has just come out of the woodwork to say how much they love this book is DEAD TO ME. Because I literally do not remember one of them telling me that I MUST READ THIS IMMEDIATELY, and they should have. I remember a bit of buzz around it as Newbery season rolled around. I remember there being "no surprise" when it was named as an honor book. So I dutifully bought it, read the first page, thought, UGH, HOW HORRIBLE! and put it aside. The sequel just came out and everyone I know is suddenly saying, I need to get it! I'm so excited! And I thought, UGH. I will TRY the first one. Holy #$%^, y'all. This book was amazing! The story of the evacuees in England has long fascinated me. And I love horses as well. So there's two things in its favor right off. But also, ALSO, this book is a heartbreaking work of staggering genius in its portrayal of grief, depression, abuse, and healing. Ada, the main character who has literally never known happiness, never been loved, does not instantly warm to their new hostess. She struggles. She is crippled not just by a club foot but by years of abuse and self-loathing. She has panic attacks. She is angry and doesn't know why or how to deal with it. It's a nuanced and honest look at what a child raised in such circumstances might actually be like. Susan, who was cast out by her father for living with another woman (this is subtle and their relationship is not labeled as such), who is gossiped about by the town (but not as much as she thinks) is struggling just to exist after the death of her partner Becky. These are damaged people, and they don't do and say the right thing because they don't know the right things to do and say. It's raw and real, as is the depiction of how England begins to change with the coming of war. I shan't go on because, well, you need to read it for yourself (if you haven't already). “I don't know what to say," she said, after a pause. "I don't want to tell you a lie, and I don't know the truth." It was maybe the most honest thing anyone had ever said to me. Man this book really packed in the feels! There were moments where I felt like I had been punched with emotion! The War That Saved My Life is about Ada, a young girl with a deformed foot whose mother kept her inside all her life. When London fears Hitler will start bombing it, all the children are sent to the countryside and Ada sees the outside world for the first time. Loved this story, so so much! Ada is such an amazing heroine with so much perseverance even when life literally kept her down. The author really did well on the historical aspects and the writing in this book flowed. I think this is a story everyone needs to read, not just children. Not bad for a middle grade novel. Not bad at all. A beautiful and heartwarming story about overcoming emotional and physical abuse, and learning to accept unconditional love from yourself and from others. Takes place during World War II in London. This novel doesn't pull punches or try to sugar coat the harshness of life. "The War That Saved My Life" will tug at your heartstrings, and reaffirm your faith in the kindness of strangers. Enjoy! Argh! I think I'm crying. Yup. What a wonderful, emotional, thought-provoking book, and written for middle schoolers! Lately I've realized that what I appreciate most in a book is when the author gives the reader some credit, and doesn't dump emotions all over the page or over explain writing techniques. Especially with books written for a younger audience, does the author have to take care to strike the perfect balance of trust and respect. Which is why this book was perfect in every respect. Bradley had such a wonderful way of introducing us to her main characters without divulging everything. She let me make my own deductions about Ada, Jaime, Susan, and even the hateful "Mam." There was some content that was hard to read about, like physical and emotional child abuse, WWII in England and its effect on the population, and overall the internal struggles that Ada had to get through as a result of her abusive background. But the overall message really touched my heart. We can't choose our family, but that doesn't mean that we can't have a family of our own making. I can't wait to jump into the sequel. "A strange and unfamiliar feeling ran through me. It felt like the ocean, like sunlight, like horses. Like love. I searched my mind and found the name for it. Joy." This is a story about Ada and her brother James. Ada's mother is a horrid woman that hates her bc she was born with a clubfoot. Calls Ada simple, cripple, worthless. World War 2 starts in England and as the kids evacuate London to go the country Ada escapes also. James and Ada live with Susan Smith. Seems mean at first but loves and cares for the kids slowly. Such a good read. I liked that the story is about a girls will to fight for her happiness. I liked that WWII in this story had little focus This is a story about Ada and her brother James. Ada's mother is a horrid woman that hates her bc she was born with a clubfoot. Calls Ada simple, cripple, worthless. World War 2 starts in England and as the kids evacuate London to go the country Ada escapes also. James and Ada live with Susan Smith. Seems mean at first but loves and cares for the kids slowly. Such a good read. I liked that the story is about a girls will to fight for her happiness. I liked that WWII in this story had little focus on Nazi's and Jews. It was definitely different bc it focused the war on a 10 yr old's self-worth. It became a try not to cry, I dare you not to cry! kind of read. Oh my heart was this book good. The kind of book that everyone should read. My heart was broken and mended, and grew about 3 sizes. I finished it in the parking lot before going in to get my groceries and sat there weeping. Then I immediately ordered a copy of the second book so that I can know the rest of the story! This is Middle Grade at its very finest. Nem sei por onde começar! Pelo menos eu já fiz um vídeo grandinho sobre esse livro onde eu consegui dizer muita coisa do que eu senti fazendo essa suficiente. Eu confesso pra vocês, sendo 100% sincero, mesmo tendo trabalho junto da Darkside para a divulgação desse livro, que eu terminei a leitura orfão. Eu queria que esse livro fosse maior! Eu conseguia enxergar esses personagens, a casa da Susan, os animais que ela descreve... eu conseguia entender as reações de todo mundo, e isso me deixou tão dentro que eu não conseguia parar de ler. Inclusive, que leitura gostosa e rápida! A Ada, personagem principal do livro, é uma menina de 10 anos que sofreu quase tudo que uma criança poderia sofrer. Ela se torna uma demôniazinha orgulhosa, mas é tão natural. Fazer essa leitura pelo ponto de vista dela foi tão realista que nem sei.... eu só queria abraçar e brigar com ela o tempo todo! Okay, this has been done before and has lots of stock characters--the disabled/abused child who gets away from a bad situation and blossoms, the adorable younger sibling who needs to be protected, the unlikely guardian who doesn't want them, but learns to love them. Yet it's fresh and new and I stayed up till well past my bedtime reading it, and I DIDN'T WANT IT TO BE OVER. In other words, it's really, really good and I thank Edelweiss for my digital ARC. It was my first read of Kimberly Brubaker Bradley and she won my heart! The War that saved my life was absolutely breathtaking and one of the best books I've ever read! While reading this book, I felt so submerged into all characters that it was hard to remember I was not Ada or Susan. Sometimes I was Susan, who was a melancholic soul and didn't want anyone in her life, for she was completely absorbed by sorrow of her loss and sometimes I was Ada, a ten years old little girl, who was fighting h It was my first read of Kimberly Brubaker Bradley and she won my heart! The War that saved my life was absolutely breathtaking and one of the best books I've ever read! While reading this book, I felt so submerged into all characters that it was hard to remember I was not Ada or Susan. Sometimes I was Susan, who was a melancholic soul and didn't want anyone in her life, for she was completely absorbed by sorrow of her loss and sometimes I was Ada, a ten years old little girl, who was fighting her own battle against all odd, personal insecurities and abominations of her mom. Well, Kimberley certainly did a brilliant job developing characters and she perfectly understood the psychology of a little girl who had always been treated horribly by her birth mom! I wonder how a mom could be so hateful! And I must say, I love stories where girls save themselves. In this book, Ada didn't just save herself but also took great care of her brother, Jamie. Her love for Jamie overwhelmed me. The way she fought back against her disability and her eagerness to learn new things make her the bravest and courageous girl one ever could be. I could almost felt her anger which she experienced when she doesn't know something. And finally, when Ada won her battle my heart leaped with tremendous joy! While still reading, I reserved the sequel and intend to read it soon. I was emotionally invested in this story and its many characters. This is a brilliantly done middle grade novel. It’s a page turner! It is an extremely well deserved Newbery Honor book. I’d have been happy had it won the Newbery Award. Ada is a great character! She’s smart and resourceful and brave and caring and loyal and observant, and inspiring. She’s also been horribly traumatized and is dealing with the ramifications of While still reading, I reserved the sequel and intend to read it soon. I was emotionally invested in this story and its many characters. Ada is a great character! She’s smart and resourceful and brave and caring and loyal and observant, and inspiring. She’s also been horribly traumatized and is dealing with the ramifications of her experiences and her situation. It’s a pleasure to watch her progress. I love Susan Smith! I might even like her better than I like Ada. She’s a natural therapist, a wonderful (foster) mother, and she is also dealing with past losses. I appreciated how her grief over her housemate and best friend Becky’s death is described but while it was obvious to me as an adult reader and might be to today’s children (but not to children when I was a child) that those two had a sexual relationship, that Susan is a lesbian, but because nothing sexual about the relationship is delved into, it’s not the focus at all, and is conveyed in a way that will go over many readers’ heads, and that’s fine. Because even though this story is about Susan and about Ada’s brother Jamie, and about quite a few other interesting characters, primarily this is Ada’s story. Ada’s and Jamie’s mother was horrible, yet believable. I thoroughly enjoyed how things ended regarding her and her children. This was also an excellent historical fiction story. It touched on WWII including the Blitz and the bombings in Kent, the area of England closest to the fight on the continent. My heart sank when the airfield was constructed where it was. This is a fine book for ages 9 and all the way up. It does get intense at times around issues of war and child abuse, issues of abandonment and neglect, but I think it manages to stay a solid middle grade novel that can also be enjoyed by adults and teens. The two main children go from age 10 to 11 and from age 6 to 7. Highly recommended for fans of books that include: historical fiction, coming of age novels, foster care, child abuse, physical disability, childhood trauma, cats, horses, country living/small town living, issues of poverty, WWII English history, books that show characters overcoming obstacles, and stories about characters caring for one another in various ways. I can't get over how much I loved the characters in this WWII English home front story. It was fascinating to me to read a book about one sibling being horribly abused by her mother while her younger sibling was treated fairly regularly. Ada seemed really realistic to me, brimming with emotions and occasionally volatile. Susan, their steadfast caretaker, was complicated, too, still mourning the loss of her "good friend", a woman named Becky whom she lived with. Ms. Baker shows how these characte I can't get over how much I loved the characters in this WWII English home front story. It was fascinating to me to read a book about one sibling being horribly abused by her mother while her younger sibling was treated fairly regularly. Ada seemed really realistic to me, brimming with emotions and occasionally volatile. Susan, their steadfast caretaker, was complicated, too, still mourning the loss of her "good friend", a woman named Becky whom she lived with. Ms. Baker shows how these characters grow and change during the time they're together, developing a relationship that turns out to be a lifesaver, despite it happening in the middle of a war. Ada discovers there are worse things than bombs after she escapes her Mam’s cruelty during a children’s evacuation of World War II London. Crippled by an untreated clubfoot and imprisoned at home by Mam, Ada has survived, but she hasn’t thrived. Only caring for her brother, Jamie, has made life tolerable. As he grows, goes out and tells Ada about the world, her determination to enter it surges. She secretly begins learning to walk and joins Jamie when Mam sends him to the country. Ada narrates, r Ada discovers there are worse things than bombs after she escapes her Mam’s cruelty during a children’s evacuation of World War II London. Crippled by an untreated clubfoot and imprisoned at home by Mam, Ada has survived, but she hasn’t thrived. Only caring for her brother, Jamie, has made life tolerable. As he grows, goes out and tells Ada about the world, her determination to enter it surges. She secretly begins learning to walk and joins Jamie when Mam sends him to the country. Ada narrates, recalling events and dialogue in vivid detail. The siblings are housed with Susan, a reluctant guardian grieving the death of her friend Becky. Yet Susan’s care is life-changing. Ada’s voice is brisk and honest; her dawning realizations are made all the more poignant for their simplicity. With Susan’s help and the therapeutic freedom she feels on horseback, Ada begins to work through a minefield of memories but still harbors hope that Mam will accept her. In an interesting counterpoint, Susan also knows what it is like to be rejected by her parents. With the reappearance of Mam, things come to an explosive head, metaphorically and literally. Ignorance and abuse are brought to light, as are the healing powers of care, respect, and love. Sweet story about a girl with a clubfoot (Ada) evacuated to the country from London at the beginning of WWII. Not only do she and her brother get away from their abusive mother, but they have the good luck to be billeted with Susan Smith, a grieving spinster lady who is estranged from her family. Miss Smith is living in the home that was willed to her by her good friend. She is not keeping up with the care of the horse that was also left to her and this is where Ada fits in. Ada is fascinated wi Sweet story about a girl with a clubfoot (Ada) evacuated to the country from London at the beginning of WWII. Not only do she and her brother get away from their abusive mother, but they have the good luck to be billeted with Susan Smith, a grieving spinster lady who is estranged from her family. Miss Smith is living in the home that was willed to her by her good friend. She is not keeping up with the care of the horse that was also left to her and this is where Ada fits in. Ada is fascinated with Butter and soon learns to ride. Her rides bring her in contact with the local gentry and their stable master (who teaches her how to care for her horse). Susan is a wise guardian to the traumatized children and it is delightful to watch all them grow in trust and love with each other. This is a middle school story, a good intro to the early events on the home front in Britain during WWII. This was so good! The story of a young girl and her brother in the early days of the Second World War in England. Ada and Jamie live with an abusive mother, who beats Ada and keeps her confined, all because Ada has a club foot. When the kids hear that children will be evacuated to the countryside, Ada and Jamie escape. There, they live for several months with Susan Smith. Together, the three become a family, while the war begins. Ada's portrayal was fantastic, with her anger, hurt, inability to tr This was so good! The story of a young girl and her brother in the early days of the Second World War in England. I feel like I really must be missing something with this one. Newbery Honor, great reviews, but to me it just felt like a story that's been done to death, with nothing really fresh. Neglected London child evacuated for safety to the country, placed with grouchy hermit, blooms and brings new joy and community integration to grouchy hermit. Good Night, Mr. Tom all over again. Only not nearly as well done. Our protagonist here, Ada, is not just horribly abused, but also crippled due to her mother's I feel like I really must be missing something with this one. 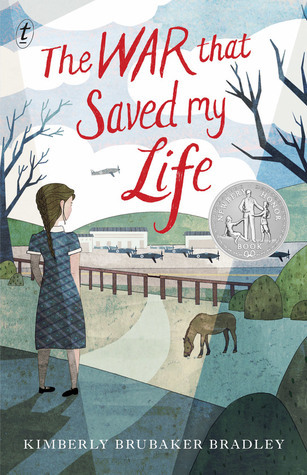 Newbery Honor, great reviews, but to me it just felt like a story that's been done to death, with nothing really fresh. Neglected London child evacuated for safety to the country, placed with grouchy hermit, blooms and brings new joy and community integration to grouchy hermit. Good Night, Mr. Tom all over again. Only not nearly as well done. Our protagonist here, Ada, is not just horribly abused, but also crippled due to her mother's neglect, and she has a brother. The author's main emphasis is on how emotionally as well as physically damaged Ada is, and how difficult it is for her to trust in the kindness of her hostess (who, of course, is suffering from her own childhood traumas). It read like a textbook for aspiring social workers, focusing on the need for endless patience and kindness when dealing with abused children. Like I was back in the classes my husband and I had to take to be licensed as foster care parents. The children's behavioral issues were presented with painful accuracy – she nailed that part with frightening vividness – but a rundown on the challenges of caring for neglected children doesn't make for much of a story. The “magic” thing in this story that touches Ada and allows her to break free of her self-constructed prison is her love of horses. This could have worked, but her transformation from crippled child crawling across the floor to skilled horsewoman is practically instantaneous and utterly unconvincing. She goes from sitting on a pony who ambles slowly around his pasture to easily mounting a full size hunter and effortlessly putting him over a wall in a single scene. Actually, she learns to read and write with similar skill, once she sets her mind to it, but for some reason it was the instant riding and barn skills that struck me as most improbable. A delightful, heartfelt and engaging read! A very well-written book on human emotions and history. 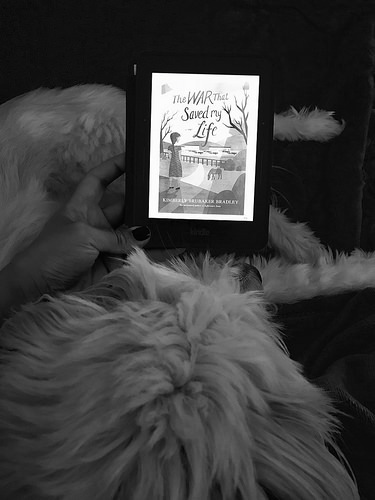 Kimberly Brubaker Bradley`s The War that Saved My Life is the story of nine-year-old Ada and her young brother Jamie, set during the times of World War II. I felt few glimpses of Roald Dahl`s Matilda, but on the whole this is a unique and nicely written book. As the blurb says, this is indeed an exceptionally moving story of triumph against all odds! A must-read. A delightful, heartfelt and engaging read! A very well-written book on human emotions and history. Sometimes a book proves so breathtakingly beautiful and poignant that words fail; that would be The War That Saved My Life. Author Kimberly Brubaker Bradley has crafted an unforgettable coming-of-age novel that launches at the cusp of the beginning of the Second World War. Ada Smith — so neglected that she doesn’t really know her age nor her birthday — has been kept in a one-room flat over a pub her entire life. Her abusive mother has never sent her to school, ashamed of Ada’s club foot; she’s h Sometimes a book proves so breathtakingly beautiful and poignant that words fail; that would be The War That Saved My Life. Author Kimberly Brubaker Bradley has crafted an unforgettable coming-of-age novel that launches at the cusp of the beginning of the Second World War. Ada Smith — so neglected that she doesn’t really know her age nor her birthday — has been kept in a one-room flat over a pub her entire life. Her abusive mother has never sent her to school, ashamed of Ada’s club foot; she’s hardly more motherly to her 6-year-old son, Jamie. Ada doesn’t know anything about their father other than some misty memories. OKAY SO THIS WAS GOOD. I just think it wasn't really for me? I did REALLYYY enjoy it, and I'll probably read the second book, because this was well-written, and it had a fantastic cast of characters, and it was sincere and honest (even though it was secular and I didn't agree with ALL of it), and I REALLY SHOULD HAVE ENJOYED IT MORE. In my opinion, the plot sagged a little. There wasn't a whole lot going on in here. The book was slooow-moooviiing and I found it super easy to put OKAY SO THIS WAS GOOD. I just think it wasn't really for me? I did REALLYYY enjoy it, and I'll probably read the second book, because this was well-written, and it had a fantastic cast of characters, and it was sincere and honest (even though it was secular and I didn't agree with ALL of it), and I REALLY SHOULD HAVE ENJOYED IT MORE. In my opinion, the plot sagged a little. There wasn't a whole lot going on in here. The book was slooow-moooviiing and I found it super easy to put down. I did like how the author wrote a book set in WW2 era, but the storyline didn't focus on the war. One of the best historical fiction books for this age range I've ever read (listened to). Narrator was fantastic, characters were perfectly done, and the pacing was on point. An incredible story of a brother and sister during WWII. Will make my Best Books of 2015 list for sure. This was a page turner almost from the start. And it ticks so many of my boxes: Heartwarming, historical, engaging, there is a cat character, there is a much older character interacting with a younger one. So much to love here. Yes, it is WWII fiction, so you have to expect some grueling bits but since this is a middle grade book, it never goes too far. There is a character in here I wondered a little about at first in that I couldn't believe anyone could be so mean but the reality is that this This was a page turner almost from the start. And it ticks so many of my boxes: Heartwarming, historical, engaging, there is a cat character, there is a much older character interacting with a younger one. So much to love here. Yes, it is WWII fiction, so you have to expect some grueling bits but since this is a middle grade book, it never goes too far. There is a character in here I wondered a little about at first in that I couldn't believe anyone could be so mean but the reality is that this does happen. There are so many characters I enjoyed spending time with in here that I am very glad my GR friends Lisa and Hilary suggested I have the second book ready when I was finished the first and so I'm ready to go! I am already wondering if the second book ends the series or if the author may be continuing it. Thank you, Lisa and Hilary, for encouraging me to read this series! This was just such an astonishingly clear-eyed and empathetic book about abuse and trauma and survival that I had to check that it really is for middle-grade readers. There are things I wish had had more detail or nuance, such as the class issues or what Ada's friend Stephen's very different experience meant to him, but those are tiny nits among a sea of praise. I loved the way the author showed the different ways the trauma of their life in London affected both Ada and her brother Jamie, and I l This was just such an astonishingly clear-eyed and empathetic book about abuse and trauma and survival that I had to check that it really is for middle-grade readers. But most of all I loved the relationships that blossomed between Susan and Ada and Susan and Jamie and Ada and the world. And I liked that she just left many things about Susan and her clearly lesbian relationship and what she thought her relationship with the village was just sort of be a bit of background detail. It seemed realistic that a ten-year-old traumatized girl would have those details sail over her head, but would still understand Susan's otherness. Esse livro é daqueles que aperta o nosso coração, mas que mesmo assim não conseguimos parar de ler, sabe? I grew up loving books by Laura Ingalls Wilder, Lois Lenski, L.M. Montgomery, Madeline L'Engle, K.M. Peyton, Noel Streatfield, Mary Norton, and Sydney Taylor. Patricia MacLachlan and Jane Yolen helped me start writing. As a child I always imagined how wonderful it would be to wake up to a pony in the back yard, but the way the farm I live on now sits it makes better sense for the pastures to be in I grew up loving books by Laura Ingalls Wilder, Lois Lenski, L.M. Montgomery, Madeline L'Engle, K.M. Peyton, Noel Streatfield, Mary Norton, and Sydney Taylor. Patricia MacLachlan and Jane Yolen helped me start writing. As a child I always imagined how wonderful it would be to wake up to a pony in the back yard, but the way the farm I live on now sits it makes better sense for the pastures to be in the front of the house. So I look out my office windows on Gully and Sarah, Pal and Mickey, Syd and Silver, and my son's red pony Hot Wheels. We have utility cats and not enough dogs.